Is it chilly where you are yet? 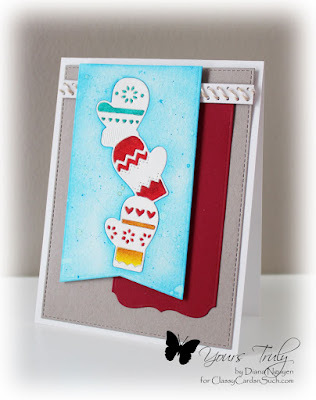 I made another card with this adorable Poppystamps Stacked Mittens. I started with a red and kraft color scheme and MFT Blueprint 13. After I die-cut out the stacked mittens out of the watercolor sheet used for the fishtail banner, I carefully removed the mittens with all the little pieces. I then sponged Broken China on the fishtail banner. I also splattered some more stain around the banner. Once that was dried, I glued the mittens back in with all the pieces. I then used a watercolor brush to color the little pieces. I added a bit of twine to a double-row hole strip from MFT Blueprint 15 and added some strong Scor-tape to make sure it would stay. Because that made it a bit bulky, I popped up the top banner with some large foam tabs.